There are lots of authors I support. So many, in fact, that I will probably have to rotate them! Here are a few. Phil Rickman writes literary mystery/thrillers, incorporating themes of ancient/sacred archaeological sites with a hint of the paranormal. I particularly like his Merrily Watkins series and would like to thank him for introducing me to the music of Nick Drake. LARRY HARRISON is a fellow member of Year Zero Writers. His novel, Glimpses of a Floating World, is available in paperback and e form from most retailers. NELL GAVIN is a US author. Her novel, Threads, begins when Anne Boleyn dies. For her soul to continue in future lives she must come to terms with many things, the first of which is to forgive Henry for causing her death. 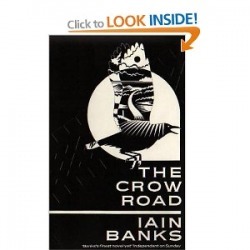 IAIN BANKS' book, The Crow Road, is one of my all time favourites. A coming-of-age/dysfunctional family/murder mystery, set in his native Scotland.